One of the fun things about being a sports fan these days is that moment when you start to lose your perspective in the midst of a visceral reaction to a play on the field. John McDonald makes a stunning play in the field? MAKE HIM A JAY FOR LIFE! Jesse Carlson strikes out the side with the bases loaded? FUTURE CLOSER! Last night, we had a similar moment soon after Yan Gomes hit a game tying homer in the ninth. Soon thereafter, my Twitter feed - spurred by Gregg Zaun's comments - looked something like: GOMES IS THE MOST VALUABLE PLAYER IN BLUE JAYS HISTORY, WITH THE POP AND THE EIGHT POSITIONS HE PLAYS! KEY TO 2013 PLAYOFFS! In the particular case of Yan Gomes, the reaction was clearly over the top, though I applaud those who were willing to get that enthusiastic in the late innings of game 160 in this cruddy season. But taking a clear-eyed view of Gomes, you have to recognize that he is really a backup catcher, and not much more. Sure, credit is due to the Brazilian rookie for picking up the slack at third and first on occasion, and for his 8.2 innings of work in an emergency role in left field. (Where he has yet to field a single ball, just so you know.) But it's important to remember that the catching position for 2013 is one of the few where the Jays have more options than roster spots at this point. With J.P. Arencibia, Travis d'Arnaud and Jeff Mathis all looking for opportunities to squat behind the dish, there would seem to be plenty of catching resources. At the same time, the Jays shouldn't be hard up when it comes to backups at first and third, nor are those defensive positions that should worry you as much as the middle infield and outfield. The thing that I've come to admire greatly about Joe Maddon's management of the team is that there are few if any sacred cows. Players - some really good players - get shifted around the diamond and up and down the lineup according to the greatest need of the day. Ben Zobrist (140 OPS+) has played right field, short stop and second base and hit everywhere from first through sixth in the batting order. Jeff Keppinger (129 OPS+) has played first, second, third and DH and hit in every spot but leadoff. And it goes on. Matt Joyce plays both left and right. Ryan Roberts shifts between second and third. Desmond Jennings flips around the lineup. Elliot Johnson and Sean Rodriguez fill in wherever they're needed. Even Evan Longoria's spot in the lineup isn't necessarily chiselled in granite, as he's occasionally batted third instead of cleanup when the situation dictated. 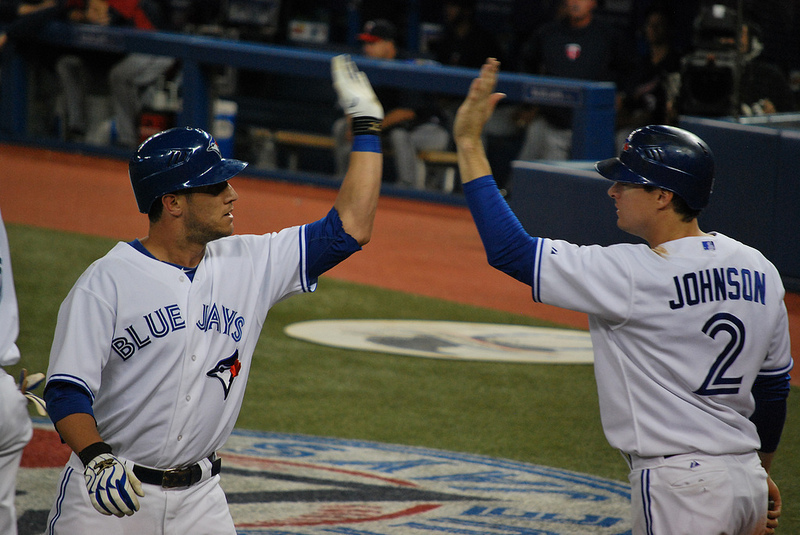 Unfortunately, the Jays' on-field management tends to lean towards the ideal that predictability is better for the players' psyche, and that players need to play very poorly to remove themselves from their assigned positions. It's true that some experimentation has been undertaken this year. The Jays experimented with Edwin Encarnacion in left, and Brett Lawrie was moved to the leadoff spot. But if the Jays are going to maximize the output that they can get from their roster, they shouldn't be afraid to move players in such a way as to get the most out of their personel. The best place to start such an approach might be José Bautista. Sure, he's stated his preference towards playing the outfield. But if Brett Lawrie were to launch himself into another injury next year, wouldn't it make more sense to slide Bautista to third if the next best offensive option in the minors is an outfielder? Wouldn't that be a good example for the Jays' putative leader to set for his teammates? Beyond that admittedly narrow example, there will be a number of roster spots to be filled for next season, and the Jays should balance flexibility with production when identifying bench players who might end up in the lineup for extended periods. For instance, players like Adam Lind and David Cooper provide offense that is insufficient at first base, and they don't have the ability to fill in elsewhere around the diamond. At the same time, bench players like Gomes, Omar Vizquel and Mike McCoy fill in defensively at a number of positions, but provided offensive contributions that were worse than negligible. On the other hand, players like Keppinger, Trevor Plouffe, Martin Prado, or Daniel Murphy might not be transcendent superstars, but their ability to adapt to different roles and positions while maintaining a reasonable level of offensive performance make them ideal additions to their teams. Their value extends beyond their numbers, because they help to keep lesser players on the bench or in the minors. Ultimately, they take playing time away from players like Yan Gomes. Which is a direction this team needs to take in the coming years. Besides, if Bautista were to selflessly move back to third base, imagine what it would do for his MVP case! Bautista could move to third, win the triple crown and get the WVP -- as long as bloggers don't get to vote. I've admired the flexibility of the TB lineup as well, and daydream of what the Jays could do similarly. Having 10 major-league quality bats to rotate into 9 spots (including DH) would give guys extra days off and save wear-and-tear. The difficult part is finding those players that can hit and play multiple positions well. God help me if we have a similar bench of Mathis, Vizquel/McCoy and Gomes again next year.